Hero officially launched the Xtreme 200R at Rs 89,900 (ex-showroom Delhi). Just a month after its launch, Hero MotoCorp announced Indian cricket team captain, Virat Kohli as the brand ambassador for the Hero Xtreme 200R. Hero Xtreme 200R prices start at Rs. 89,900 (Ex-Showroom). Hero Xtreme 200R is available in 1 variants and 5 colours. Share your experiences with Xtreme 200R? Q. What is single channel ABS and what exact use for ABS? Q. My height is 6 feet and about 90 kg and a family person I want to buy bike for good for pillion please suggest I am confused among Unicorn, Achiever, Xtreme 200 and Apache RTR 180. My budget is 1 lakh. Q. Which is good bike for back pain? The true comfort of the bike can only be evaluated if you take the test ride of the bike. We can't give a verdict as the choice and comfortable riding posture differ from person to person. Q. Is this bike vibrates after crossing speed of 80-90 and what is special of this bike like another bike? Q. First service me engine open karawna jaroori hai? It is not necessary to unbolt the engine of the vehicle on the first service until and unless it is required to fix any issue regarding the engine. Q. Which is good to buy, Xtreme 200R or NS200 for daily commuting and occasionally touring? Hero is pitching the new Xtreme 200R at the practical end of the 200cc category. But is that a good enough proposition in this segment? 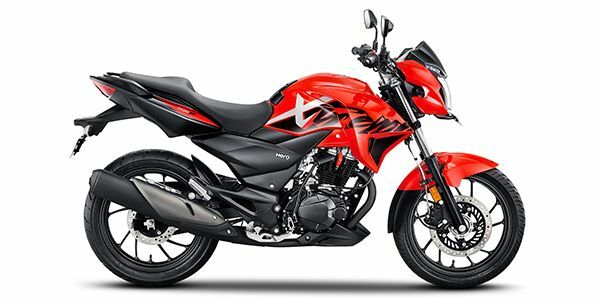 In terms of design, the Hero Xtreme 200R is very similar to its younger sibling, the Xtreme Sports; however, it is sharper and sportier looking. Still, the two-tone colour combination and graphics are a bit too dramatic and seem to be overdone. The tail section is much cleaner though the split-seat option makes way for a more conventional single seat. Features include LED DRLs and LED tail-lamps. Highlights are a single channel ABS, a first for Hero. The semi-digital instrument cluster offers basic information such as the speedometer, odometer, fuel-range, a clock and a service indicator. On the spec front the 200R gets an all-new, 199.6cc, air-cooled, single-cylinder engine developed in-house at the Hero’s plant in Jaipur. It makes 18.4PS of power at 8000rpm and 17.1Nm of torque at 6500rpm and is is mated to a 5-speed gearbox. Hero says the engine is designed to deliver more low-end torque and claims a 0-60kmph time in 4.6 seconds and 114kph top speed. Claimed fuel efficiency is 39.9kmpl. The frame is a diamond-type chassis with a 7mm longer rear swingarm. Suspension components include a 37mm telescopic front fork and an adjustable monoshock unit at the rear. Braking is via 276mm front and 220mm rear disc brakes, with a standard single-channel ABS. Bajaj Pulsar NS 200: Taking note of the success achieved by the Apache RTR 200, Bajaj relaunched the NS 200 in India in 2017. The Pulsar NS 200 offers great value for money and performance for its asking price. Muscular looks with new graphics endow the bike with design flair, while engine refinement and build quality has scope for improvement. Yamaha FZ25: The Yamaha FZ25 is a good option for someone looking at a daily runner that can double up as an able tourer on the occasional highway jaunts. Yamaha’s legendary reliability, good performance from the motor and stylish design make it a great package. Yes, it does command a premium over the TVS Apache RTR 200, but it is well worth the extra moolah. TVS Apache RTR 200: The TVS RTR 200 is a very capable motorcycle. When compared to the NS 200, the Apache RTR 200 not only is more commuter-friendly but also more economical to run in the city. It is a good option for someone looking for a fun-packed motorcycle with good low-end torque and a dash of performance. In terms of competition, the Hero Xtreme 200R has a tough battle on its hands. Particularly owing to the features, power and styling on offer, which makes the competition a lot more value for money. During our first ride it came across as a more commuter focused 200cc bike, which is easy going. So if that's the kind of machine you are looking for? Go for it! Motorcycle News Of The Week: Yamaha Introduces MotoGP Colour For R15 V3.0, Indian Chieftain Elite Launched, Hero Xtreme 200R To Go Sale And More! I own this for the last 4 months it's good for my daily commute. I am enjoying it. Confused about Hero Moto Corp Xtreme 200R?